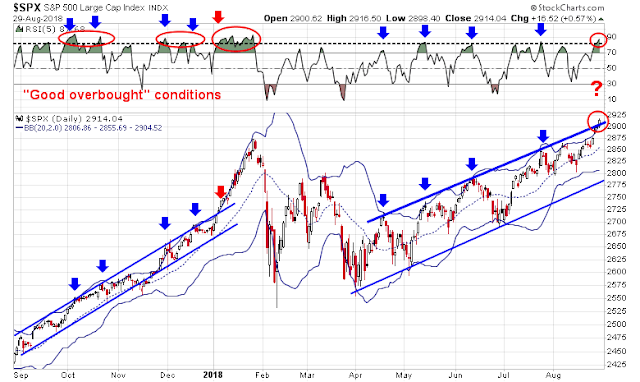 On the verge of a “good overbought” rally, or market stall? The key difference between the rallies in 2018, and the melt-up advances that began in late 2017 is the degree of positive breadth participation. The 2017 episodes were marked by strong breadth and momentum that exhibited themselves in a series of “good overbought” RSI-5 readings. The strong display of momentum enabled stock prices to rise even further and in a steady manner. The key question for traders is whether the current rally turn into a “good overbought” advance, or will it stall at trend line resistance? I vote for the stall scenario. Here are a number of reasons why. 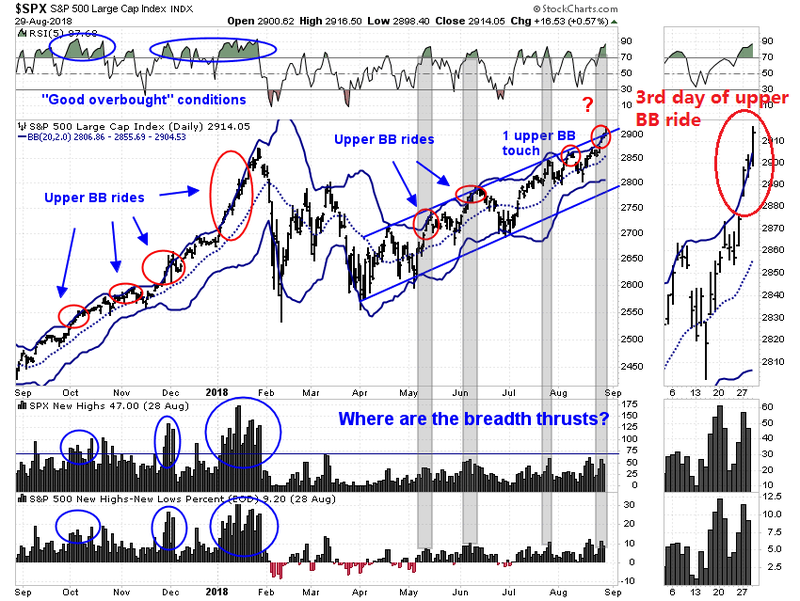 First, the lack of breadth surges is disconcerting. The chart below shows the difference between the 2017 rallies and the 2018 rallies. Where are the breadth surges, especially when the market is testing trend line resistance, and the upper BB? In addition, recent upper BB tests have lasted 1-3 days. Today is day 3. How much further can the market rise from here without a breadth surge? 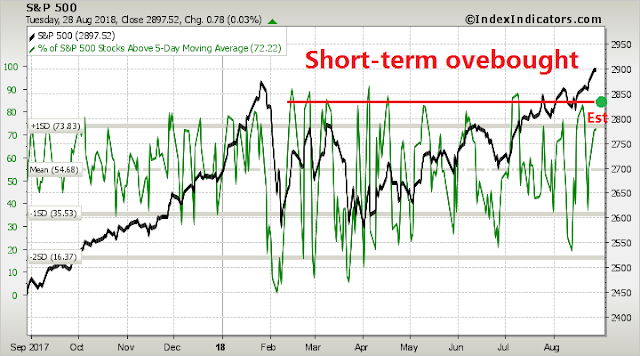 Medium term (1-2 week) breadth from Index Indicators tell a similar story. 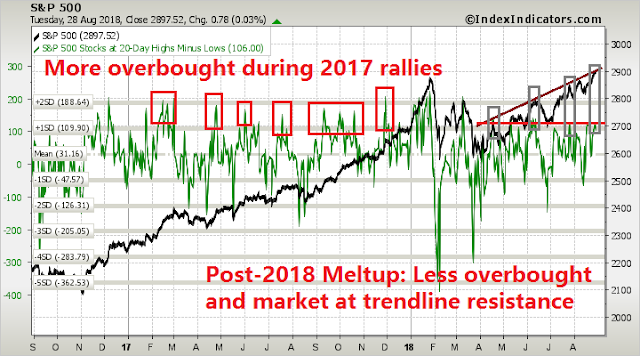 The rallies in 2017 were marked by stronger overbought readings compared to the ones in 2018. The current episode is similar to other 2018 rallies where the market became mildly overbought, reached trend line resistance (grey rectangles), and retreated. Unless the market can exhibit even stronger follow through, the odds favor weakness here. Short term (1-2 day) breadth from Index Indicators also shows that the market is overbought and ripe for a pullback. In effect, both short (1-2 days) and medium term (1-2 week) breadth are highly extended, indicating that market weakness can occur at any time. As well, the Fear and Greed Index was within a whisker of its overbought target of 80-100 as it now stands at 79. Is that close enough to call the top to this rally? Even if you are bullish, do you really want to be buying here instead of waiting for a pullback? Finally, this coming Friday is QT day, when roughly $21b of Treasury securities roll off the Fed’s balance sheet (via NY Fed). Such events have tended to be equity negative in 2018. Admittedly, I was a little early (wrong) in turning bearish on a tactical basis, these conditions strongly suggest that a bearish reversal is at hand. My inner trader is holding to his short position, and he is considering adding to it on a downside break. Market’s been strong these last few days, so I was wonder about your short position. Thanks for the timely update! All this begs the question – what will make you change your mind (what will make it good overbought)? As I pointed out, we need the market to exhibit some breadth thrusts in order for these “good overbought” readings to be sustainable. At a minimum, we need to see some bullish follow through now that the S&P 500 has marginally overthrown its rising trend line. Thank you for the update Cam. Nice insight and indicators as always. Noticed yesterday Bespoke tweeted ALL S&P 500 sectors were in overbot territory. Looking at the market action today and yesterday it looks like investors are fleeing into the relative “safety” of mega cap tech stocks like AAPL and AMZN. FB and NFLX also doing well. Is that a bet on “lower for longer” while avoiding the trade war risks?